GLAAD today released its annual Where We Are on TV report; a comprehensive forecast of the lesbian, gay, bisexual, transgender, and queer (LGBTQ) primetime characters in the 2016-17 television season. This marks the 21st year that GLAAD has tracked the presence of LGBTQ characters on television, and now the second year we have counted LGBTQ characters on original series which premiere on the streaming content providers Amazon, Hulu, and Netflix. Of the 895 series regular characters expected to appear on broadcast primetime scripted programming in the coming year, 43 (4.8%) were identified as LGBTQ. There were an additional 28 recurring LGBTQ characters. This is the highest percentage of LGBTQ regular characters GLAAD has ever counted on primetime scripted broadcast programming. The five broadcast networks are ABC, CBS, FOX, NBC, and The CW. Other encouraging findings include a record-high percentage of black series regular characters on broadcast television (20% of all series regulars), and a record-high percentage of regular characters with disabilities on broadcast television (1.7%). Additionally, the number of regular and recurring transgender characters across all platforms has more than doubled since last year (from 7 to 16 this year across broadcast, cable, and streaming series). Last year, there were no trans characters counted on broadcast. The number of LGBTQ regular characters counted on cable increased from 84 last year to 92 this year, while recurring LGBTQ characters dropped from 58 to 50. This is a total of 142 regular and recurring LGBTQ characters, equal to last year. While on streaming originals both regular and recurring LGBTQ characters are up, with 45 regular characters (an increase of two) and 20 recurring characters (up from 16) for a total 65 LGBTQ regular and recurring characters on streaming original series. While much improvement has been made and TV remains far ahead of film in terms of LGBTQ representation, it must be noted that television – and broadcast series more specifically – failed queer women this year, as character after character died, continuing the harmful ‘bury your gays’ trope. Over 25 lesbian and bisexual female-identifying characters have died on scripted broadcast and cable television and streaming series since the beginning of 2016. This comes after last year’s Where We Are on TV report called on broadcast content creators to do better by lesbian and bisexual women after many superfluous deaths. It continues a decades-long trend of killing LGBTQ characters – often solely to further a straight, cisgender character's plotline – which sends a dangerous message to audiences that LGBTQ people are secondary and disposable. It is important that creators do not reinvigorate harmful tropes, which exploit an already marginalized community. The number of regular and recurring transgender characters across all three platforms tracked has more than doubled, from seven characters last year to 16. There are three trans characters counted on broadcast, six on cable, and seven on streaming original series. Of the 16 characters, four are transgender men. Lesbian representation dropped dramatically on broadcast television, down 16 percentage points to 17% of all LGBTQ characters. Lesbian representation is also down on cable, to 20% from 22% reported last year. Bisexual representations on broadcast rose to 30%, up by ten percentage points from last year. Bisexual representations also rose on streaming series, from 20% to 26%. However, cable series have dropped in bisexual representations from 35% to 32%. Bisexual women far outnumber bisexual men on every platform. Many of these characters still fall into dangerous stereotypes about bisexual people. Each platform tracked (broadcast, cable, streaming) counts one character who is HIV-positive, though only broadcast television counts the character as a series regular (Oliver on ABC's How to Get Away with Murder). Cable and streaming platforms still need to include more racially diverse LGBTQ characters as a majority of LGBTQ regular and recurring characters on each platform (72% and 71% respectively) are counted as white. Overall racial diversity is up again with 36% (325) of 895 series regular characters on broadcast counted as people of color, which is a three-point increase from last year's report. This year, 44% of regular characters on primetime broadcast programming are women, which is an increase of one percentage point from last year but still greatly underrepresents women who make up 51% of the population. GLAAD’s annual Where We Are On TV report not only propels national conversations about LGBTQ representation, but informs GLAAD’s own advocacy within the television industry. 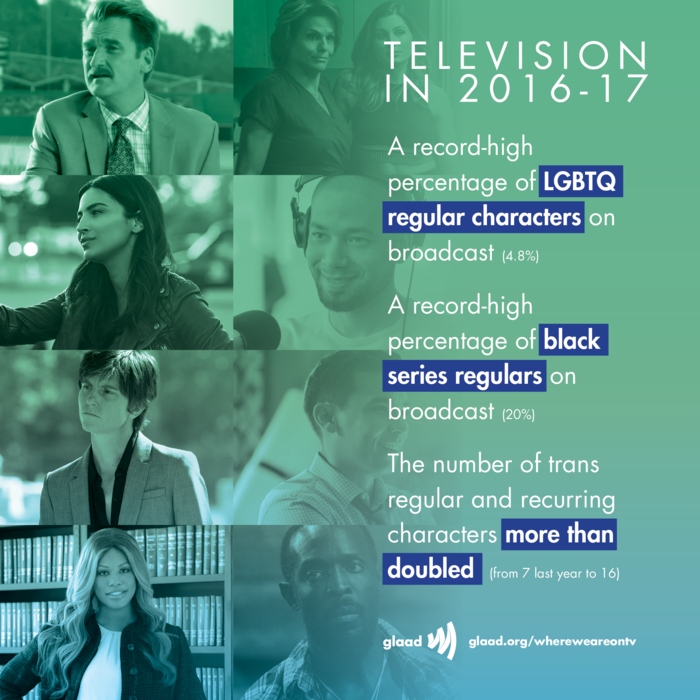 GLAAD uses this yearly data to create a clearer picture of the stories and images being presented by television networks, and to encourage networks to include diverse LGBTQ representations within their programming.